In busy railway stations everyday activities and dramas are occurring. Do you ever wonder where everyone is going or what is happening in their lives? "Audio Obscura" by Lavinia Greenlaw takes you to the edge of this space. Like camera obscura (defined as a darkened enclosure in which outside images are projected) audio obscura places you to an audio equivilant. Snatches of a conversation, thoughts heard out loud, sometimes dark dramas are played out. 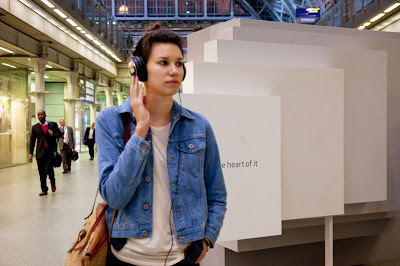 Put on the headphones and wander around the station and you will be drawn into another world. 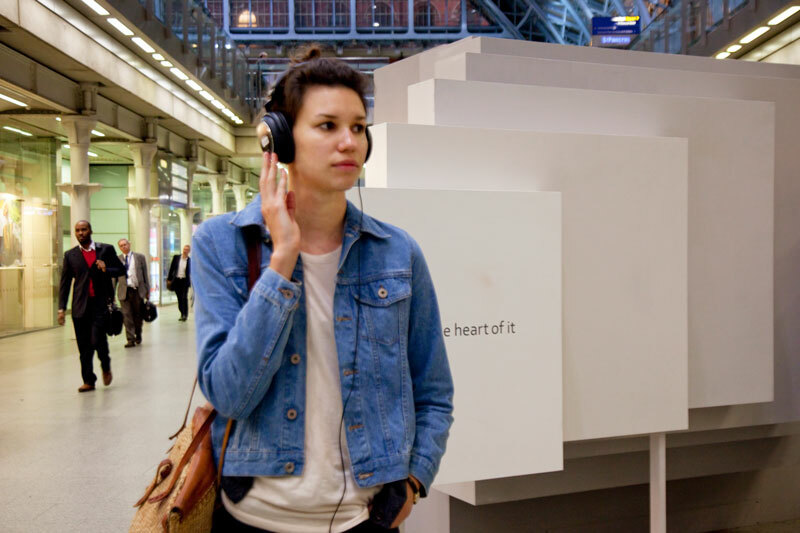 On at St Pancras International Station until October 23. I often sit and watch people going by, wondering what is happening in their worlds, actually, I also find myself doing the same thing when driving to work, so many people, where are they all going? I'd rather not hear other people while travelling by rail. I'm always curious about other people's lives. They all look so determined and important. I wonder that all the time! I'd like for there to be an exhibit like that in Montreal. Interesting idea. Humans are curious beings.